Brian and I travelled to Phoenix, AZ last weekend for the AZCubing Winter 2016. We were excited to make it out to another one of Mike DeCock’s competitions after having such a good time at his inaugural competition last November. Mike didn’t disappoint — larger venue, better lighting, and an overall professional feel (sturdy cube covers with the AZCubing logo, a straightforward judging system, well laid out seating). I was impressed, and hope to see Arizona continue to blossom as a speedcubing state. I love to watching speedcubing grow, so new faces at events, young and old, are always a great sign. It’s funny, I remember being one of the youngest competitors at my first WCA tournament. The veterans at that competition were Jim Mertens, Mike Hughey, and Tyson Mao. Dakota Harris was the fast guy, and he had only been cubing for a couple of years. I still have an autographed cube with their signatures on it. Now, I’m one of the older competitors at most of the competitions I go to — I’ve grown, and so has the community. So, we arrived on Friday and were picked up by Eric Limeback’s mom, Brenda, she’s seriously the best. It’s no wonder Eric turned out so cool. Speaking of the Limebacks, this wasn’t the first time they had welcomed me into their home, so let’s talk about them for a minute. I met Eric in Toronto in the summer of 2010. Actually, it was summer of 2009. Wow, have we really been at this for that long? Time flies, man. Anyway, when I met Eric he was already ranked in the top 10 in the world in 3×3, and I was a shy fifteen year old just appearing on the scene. Still, the Limebacks happily took me in for the weekend, and I had a blast. We spent most of the weekend in Eric’s bedroom doing TeamBLD nonstop — coming up with codes and refining our system. We had beat the UWRs by the end of the weekend. Haha, good times. Eric’s an incredibly authentic guy, and one of my closest friends now. I admire his ability to both lighten, and light up any atmosphere. I admire a lot of qualities that I see throughout the speedcubing community. It’s a special group of people, and I feel so fortunate to have the ability to connect with awesome people through the cube. 2×2: As usual, I borrowed a 2×2 for both rounds. I might become interested in 2×2 again eventually, but I’ve only solved it in competition since Worlds 2015. Shout-out to Shonathon for knocking me off the podium by .01. 3×3 OH: My turning felt a lot less shaky than usual. Not particularly fast, but fairly smooth. I used a few ZBLLs one-handed for the first time in a few solves. It turned out fairly well overall, will be even better once I’ve practiced the algs. 3×3: I started off the first round of 3×3 with an EPLL skip (I used an OLLCP and it solved the LL completely), which set the tone for the rest of the day. My solves were certainly not error free, but aside from a couple of lockups and +2 mistakes my turning felt good. Brian judged and videotaped my second solve, which ended up being a mid-7. The average was 8.34, and I had five 7s throughout the three rounds. Very happy that sub-8s are becoming easier in competition! Lunch: We had lunch at Jimmy John’s with Austin Reed, Nick Stanton, and Tristan Wright (aka Thrawst). I learnt about weird time zones in Arizona, and we all agreed that Steph Curry has the shot. Awards: Shout-out to Nick and Austin for once again proving they’re the top-2 in Arizona! And congrats on your first sub 10 average, Austin, well deserved. Nick, your beard deserves its own award. Also, shoutout to everyone who set PBs and/or ended up on the podium — in particular, Sophie Berman, you don’t often see girls winning events at these competitions, so keep cubing, Sophie! Post competition: We went to an MLB preseason game on Sunday. Funny enough, the game was coincidentally the Seattle Mariners vs the Texas Rangers. 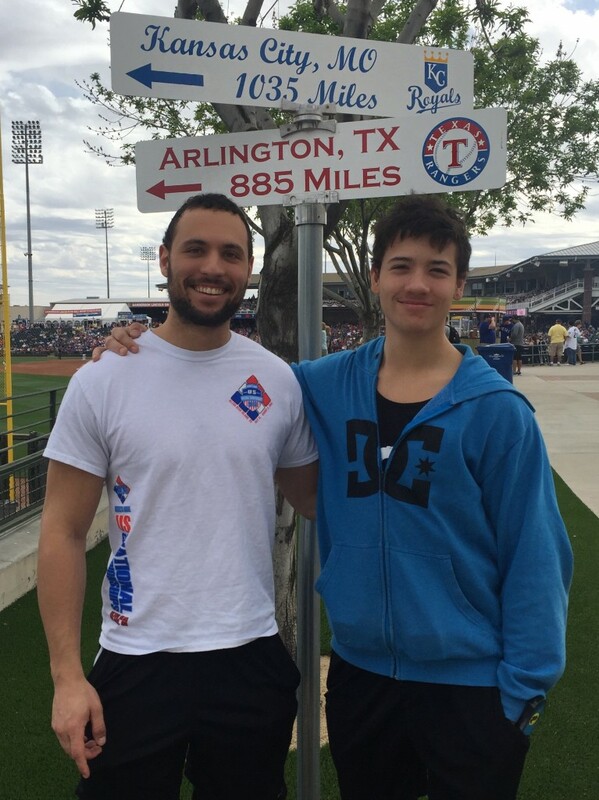 Brian and I live about a mile away from Globe Life Park in Arlington, where the Rangers typically play. I guess we’re loyal fans. Great website, man. Sad I couldn’t be there for the competition but we’ll make up for it this summer ;). Let’s start planning soon! Can’t wait! Just simply wished to stress I’m happy that i came onto your webpage!. 2016 | Anthony Brooks <Liked it!